This article, first printed in the Watermark News, references the Glow event from 2013. If you are interested in participating in Glow, new details should be available at watermark.org/glow or by contacting externalfocus@watermark.org. One day each summer, Watermark volunteers, as well as health, beauty and nutrition professionals work together for a very special purpose: encouraging, pampering and sharing hope with women in need. 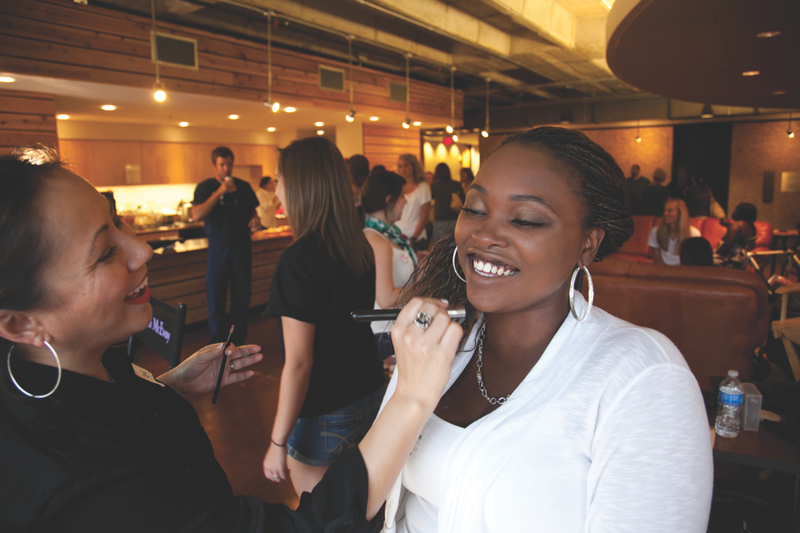 The event is GLOW: A Day of Beauty, offering women an opportunity to talk with professionals about health and nutrition; have their hair cut, colored and styled; receive manicures, facials, massages; and have their makeup done. The women at GLOW will be from ministries where Watermark members have been building relationships all year long. Those organizations include Cornerstone/South Dallas, Exodus Ministries and Center of Hope – all ministries that share the hope of Christ and help women put their lives back together. GLOW is an opportunity to provide personal care for women in a way many have never experienced. Melanie, a GLOW participant in 2012, said that the event gave her much more than a pretty haircut. “I had a relapse with alcohol a while back,” said Melanie. “I was homeless for about three months. When I went to rehab, I finally realized I couldn’t live in sobriety without Christ. He helped me get rid of my false idol: me. “Being at GLOW was really overwhelming. It’s been a long time since I’ve had a hair cut. The people here also made me feel respected and not looked down upon. You don’t get that on the streets. It feels like God’s love is being bestowed on me today,” Melanie said. Hairstylists and beauty professionals are a big part of making GLOW happen each year. But there are other needs as well, including volunteers to host our guests for the day and make them feel at home. There are also opportunities to help with nutrition classes, makeup application, massage, manicures, and pastoral care. The post GLOW: A DAY OF BEAUTY appeared first on Watermark Community Church Blog.